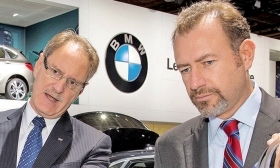 General Motors President Dan Ammann, right, has given Cadillac President Johan de Nysschen wide latitude to turn around the luxury brand. DETROIT -- Just over five years ago, Dan Ammann was a little-known, thirty-something Wall Street investment banker, toiling away on complex corporate deals and restructurings for Morgan Stanley. The even-keeled New Zealander harbored no ambitions about joining the auto industry, let alone scaling the heights of a giant automaker. But in a surprise career change and then startling ascension, Ammann now oversees General Motors' operations around the world. As president, he's responsible for two tasks that his boss, CEO Mary Barra, sees as key to the company's success: revitalizing Chevrolet and Cadillac, while also unifying how the company's historically fractured regional businesses make and sell vehicles. Both are goals that have eluded generations of GM executives, most of whom had far more auto experience than Ammann. He was promoted from CFO to GM's top operations job in early 2014 as a career finance guy with little operational background. Now Ammann, who turned 43 last week, has his hands on virtually every important aspect of the business. He oversees the heads of GM's four big regions: North and South America, Europe and its International Operations unit, which includes China. Global Chevy chief Alan Batey and Cadillac President Johan de Nysschen report to him. Product planning and GM Financial also are under his purview. Ammann has been showing up everywhere in his first 15 months as president, untethered from the financial jobs that mostly sequestered him in Detroit or New York. He's chatted up factory workers in China, peeled around racetracks in Britain and popped into dealerships from Dubai to Dallas. Much of his overseas work has focused on aligning GM's marketing and sales operations, which long have been run autonomously. For example, GM is using its U.S. dealership network setup as a template in other countries. Another example: Ammann recently promoted U.S. Buick chief Duncan Aldred to lead the brand globally. The move gives Aldred oversight of GM's massive Buick business in China. Even two years ago, "that couldn't have happened," Ammann said during a recent interview. "The people over there would have said, 'Look, this is 900,000 cars; the U.S. is 200,000. We've got this thing under control.'" Ammann is trying to fix a problem that has long handicapped GM relative to Volkswagen AG, Toyota Motor Corp. and other big rivals, says Xavier Mosquet, a senior partner at Boston Consulting Group who advised the U.S. government on its bailout of GM in 2009. GM historically has been "not only regionally managed, but regionally independent." That mentality is why some Opel executives were pulling for GM to sell Opel when GM was shopping the European business in 2009, Mosquet says. Ammann joined GM as treasurer in April 2010, after advising the company on its restructuring a year earlier. His work caught the eye of then-GM CFO Christopher Liddell -- a fellow Kiwi -- and Steve Girsky, who had joined GM's board after advising the government's task force. Ammann is known among colleagues for an unflappable demeanor, cut-to-the-chase questions and a dry wit. Asked in the interview about the recent Russia move, he answered with a straight face: "We've decided it's better to have a more commercial, for-profit mindset." He then chuckled at the reference to GM's historical habit of tolerating losses. He's also frank about the challenge of returning Chevy and Cadillac to glory. The efforts of Chevy marketing boss Tim Mahoney and Batey over the past two years to unify Chevy's hodgepodge identity across the globe have given GM's core brand "a good starting point. But that's all it is," Ammann says. In Cadillac, GM has "the beginnings of a legitimate luxury business," but one that "needs work." Rebuilding Cadillac is a task that Ammann made a top priority almost immediately after taking the job. Three years as CFO gave him a close look at the need for Cadillac, which now represents just 3 percent of GM's global vehicle sales, to pull more weight so that GM isn't overly reliant on pickups and SUVs for profit. Even before his promotion, Ammann had casually discussed the luxury business with dealers, competitors, analysts -- "pretty much anyone who would talk to me." He concluded that Cadillac was stuck in a mainstream sales enterprise with its sister GM brands when luxury requires a more nuanced approach. Ammann separated Cadillac as a stand-alone unit with its headquarters in Manhattan. In early 2014, Ammann courted de Nysschen, the then-Infiniti boss, in clandestine meetings at auto shows in Geneva and other places. He has given de Nysschen wide latitude to execute his turnaround plan. A big part of Ammann's job is to serve as a conduit between the brands and GM's product-development organization, run by Mark Reuss. Ammann often sits in on powertrain planning meetings on Thursdays. Some Fridays are spent with Reuss testing engineering mules at GM's proving grounds near Detroit. Reuss says that Ammann gives him "a single point contact for us to execute what customers want in each of his regions." If Reuss chooses a continuously variable transmission for a future vehicle, rather than a dual-clutch, Ammann's team is in on the decision so it's not second-guessed later. "It makes everything a hell of a lot easier," Reuss says. It also makes it easier that Ammann "likes cars," says Reuss, GM's highest-profile car enthusiast. Ammann used his first bonus from Morgan Stanley to buy a 1961 Cadillac Series 62 convertible and is a certified test driver on the Nurburgring Nordschleife racetrack in Germany. Those are car-guy bona fides that were lacking in the GM finance enterprise of old. Ammann views the most important part of his job as "having the right people in the right places." He likes the current mix of GM lifers and outsiders, including a large contingent of VW veterans, such as de Nysschen, International Operations head Stefan Jacoby and Opel chief Karl-Thomas Neumann. He says not to expect the sort of constant executive turnover that has marked GM in the six years since bankruptcy. "I think we underestimate the benefit that will come from the consistency of people being in position," he says, "and getting the chance to execute and deliver."